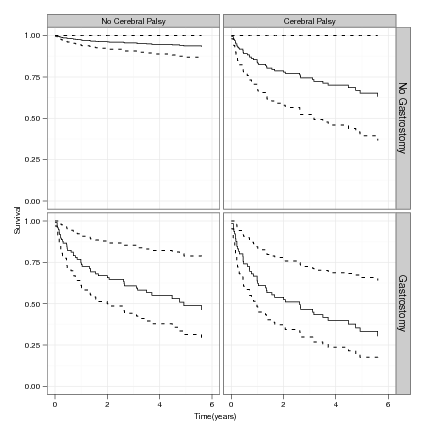 New paper: Survival analysis | Why? Each year I try to carry out some statistical consultancy to give me experience in other areas of statistics and also to provide teaching examples. Last Christmas I was approached by a paediatric consultant from the RVI who wanted to carry out prospective survival analysis. The consultant, Bruce Jaffray, had performed Nissen fundoplication surgery on 230 children. Many of the children had other medical conditions such as cerebral palsy or low BMI. He was interested in the factors that affected patients’ survival. need for revision surgery. This was when the child had to return to hospital for more surgery. an interaction term between gastrostomy & cerebral palsy. The main finding of the paper was the negative effect of cerebral palsy and gastrostomy on survival. Unfortunately, if a child had a gastronomy or had cerebral palsy then survival was dramatically reduced. The interaction effect was necessary, otherwise we would have predicted that all children with a gastronomy and cerebral palsy wouldn’t survive. There was a rather strange and strong gender effect – male survival was greater than female. The revision covariate was also significant – children who needed their fundoplication redone had increased survival. At first glance this is strange – the operation had to be redone, yet this was good for survival. However, this was really a red herring. Essentially children who had their surgery redone had by definition survived a minimum amount of time. I think something a bit more sophisticated could have been done with this variable, but the numbers weren’t that large. Wockenforth, R., Gillespie, C. S., Jaffray, B. (2011). Survival of children following Nissen fundoplication. British Journal of Surgery (preprint). Wickham, H. (2009). ggplot2: An implementation of the Grammar of Graphics. R package version 0.8.3. This script also shows censoring of observations, as used in SAS. Would you mind sharing your code for this?